As part of the blog series summarizing the Fraser Institute’s Demographics and Entrepreneurship essays, this post examines the effect of capital gains tax reform on entrepreneurship. Entrepreneurship is critical for economies to grow, become more productive and create new jobs. But populations in advanced economies are aging, and this will likely lead to lower levels of entrepreneurship while at the same time increase the strain on social welfare programs and the political need for a strong economy to produce sufficient tax revenue to sustain them. As our chapter in a new Fraser Institute book notes, reforming capital gains taxation is one policy option that could help spur entrepreneurship (a capital gain occurs when an asset is sold for more than its original purchase price). Entrepreneurs risk their own capital (and that of venture capitalists and other financiers) and spend time in the hopes of ultimately profiting from an unproven technology, product or service. They expect to be compensated if the business matures and generates financial returns. This process is key to a successful economy because it produces new technologies, products and services, and ultimately leads to job-creation and increased prosperity thanks to a better allocation of labour and capital. But capital gains taxes reduce the return entrepreneurs and investors receive when selling some or all of a new technology or business. This diminishes the reward for entrepreneurial risk-taking and reduces the number of entrepreneurs and the investors that support them. Capital gains taxes also affect an entrepreneur’s ability to attract managers from traditional business sectors. Startup firms cannot typically offer salaries with established businesses and therefore often recruit managers using equity stakes. Capital gains taxes reduce the returns these managers receive, thereby diminishing the likelihood startups will be able to attract the talent growth requires. Research has also found that capital gains taxes can lengthen the time entrepreneurs hold on to their businesses instead of selling them to professional managers. There’s a growing body of academic research investigating the impact of capital gains taxes on entrepreneurship. Most studies focus on how a lower rate of return due to capital gains taxes affects the actors in the entrepreneurial process—entrepreneurs and their financiers. New research has also sought to better understand the impact of capital gains taxes on entrepreneurial innovation and the development of new ideas. While the structure and rates of capital gains vary considerably by country, for context the chart below displays the top personal marginal capital gains tax rate on securities, investments, shares, etc., for 2016/17 in 35 OECD countries. 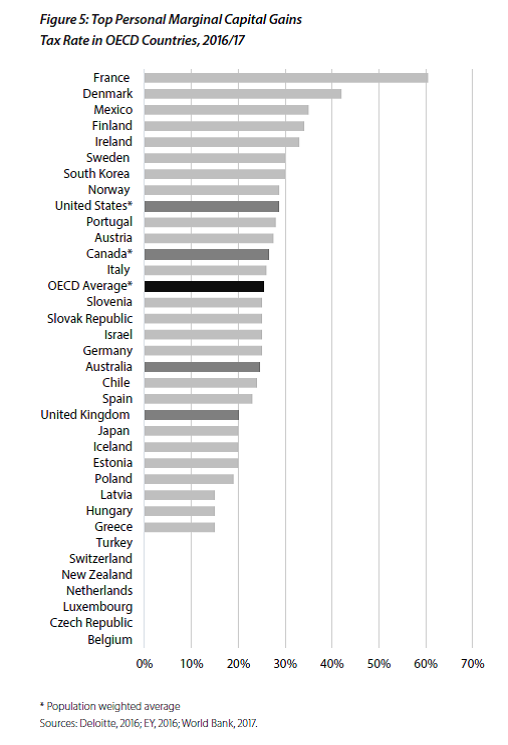 Compared to other countries in the OECD, Australia, Canada, the United Kingdom and the United States all have room for improvement with their top personal capital gains tax rates. Below, we outline three different policy options regarding capital gains taxes governments could pursue to increase entrepreneurship. The first and more comprehensive reform option is to completely eliminate capital gains taxes. This would provide a considerable boost to economies at a small short-run fiscal cost, and potentially a large gain in tax revenues in the long-run. A second option is to lower capital gains tax rates. However, the way governments would lower capital gains tax rates depends on the country. In Australia and Canada, for example, capital gains are treated as taxable income, meaning capital gains are taxed under personal marginal tax rates. Both countries have a 50 per cent inclusion rate, meaning that only 50 per cent of a capital gain is taxable. Reducing the inclusion rate to say 25 per cent is one way to lower the capital gains tax rate. A third policy option is to introduce rollover mechanisms for capital gains investment, which would effectively keep the basic parameters of the capital gains tax regime in place but allow for a deferral of capital gains taxes for individuals on the sale of assets when the proceeds are reinvested within a certain timeframe, perhaps six months. The purpose of such a policy would be to encourage investors to shift capital from less productive investments to new more productive opportunities. As governments consider policy responses to spur entrepreneurship in the wake of demographic changes, capital gains tax reform offers considerable potential. The economic evidence is clear—these types of taxes constrain the level of entrepreneurship in an economy.